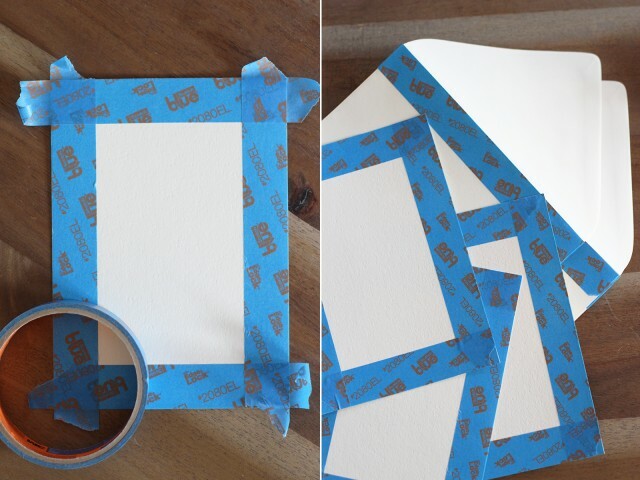 Start by masking off the backside of your paper. It’s important to use heavier weight paper with texture. 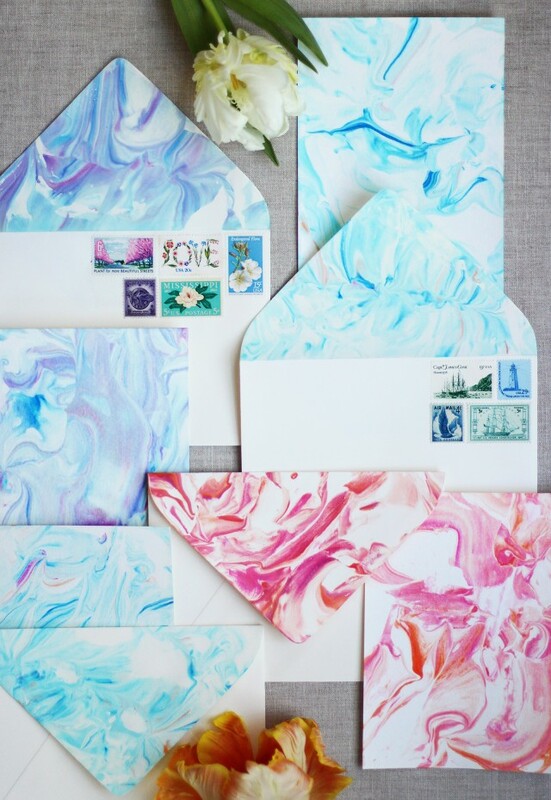 We personally love Paper Source’s Lux White 5×7 notecards and envelopes. Now the fun part begins. 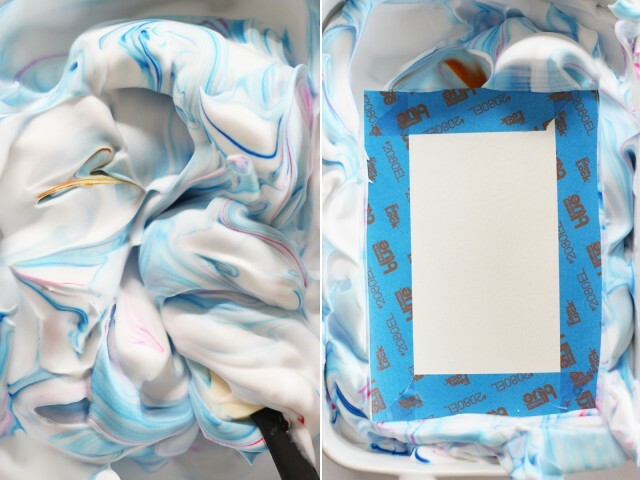 Spray a nice, thick layer of shaving cream into a rectangular baking dish – one that is large enough to easily fit your paper inside. 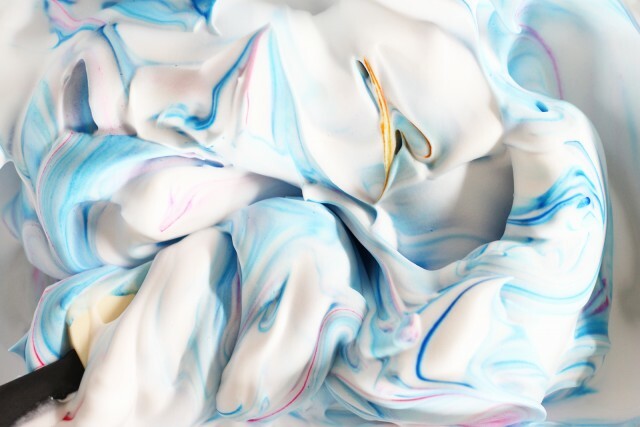 Put just a few drops of food coloring into the shaving cream. I used gel food coloring here which worked fine. You can also use liquid. 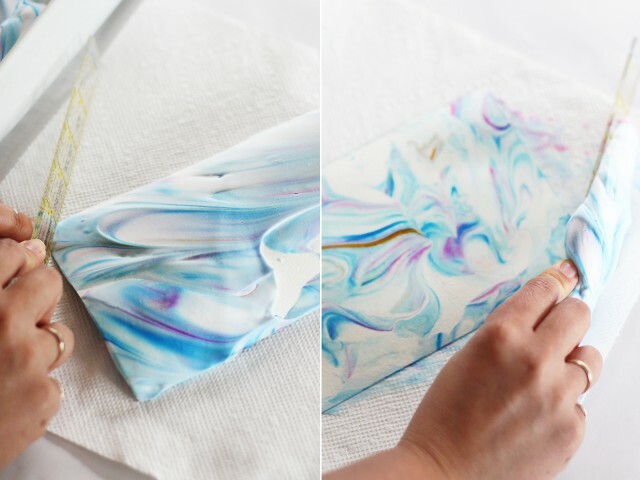 With a rubber spatula, start folding the shaving cream to incorporate the color. Don’t over mix as you’ll want to keep that nice swirly pattern. 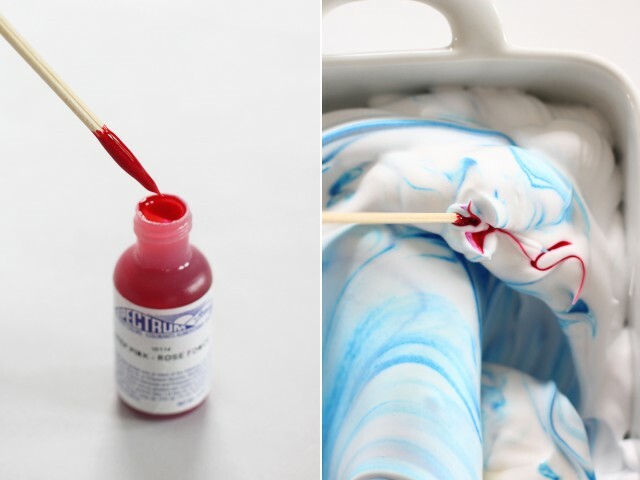 Once your base color is swirled, you can add additional colors with a toothpick or wooden skewer. Simply dap the skewer into the food coloring and swirl is around in different areas. If you don’t want the colors to mix or muddle, do not over mix or blend. 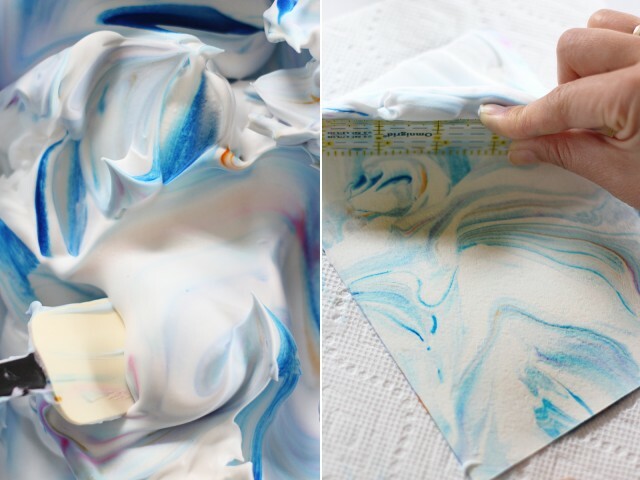 Your pattern doesn’t have to be perfect – don’t worry about “marbling” the shaving cream too much. 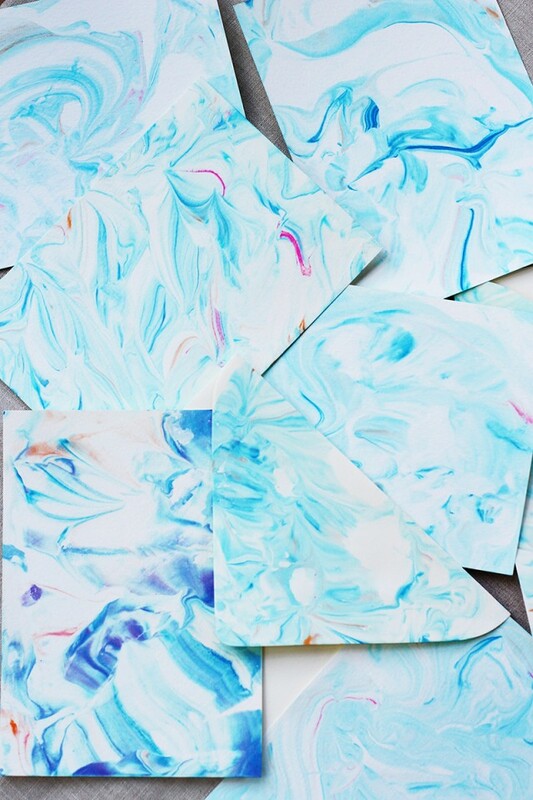 It will do all it’s marbling magic on its own. 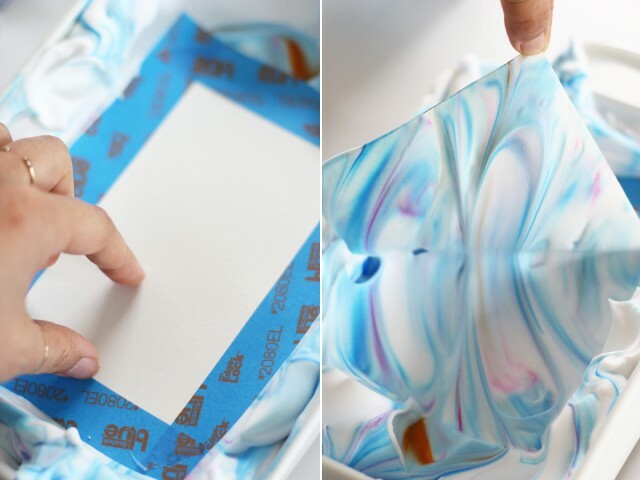 Place the paper, tape side up, onto the shaving cream. 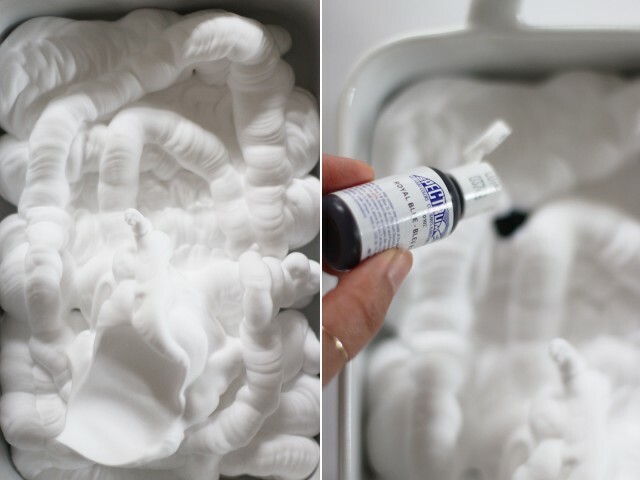 Use your fingers to gently press down the paper so that as much of it makes contact with the shaving cream as possible. You don’t want the paper to sit for too long as it will start to get too wet. Gently lift the paper off the shaving cream from one corner. Place it onto a paper towel. Take your ruler and from one corner, scrape the shaving cream off in one sweeping motion. Viola! Amazing, no?? 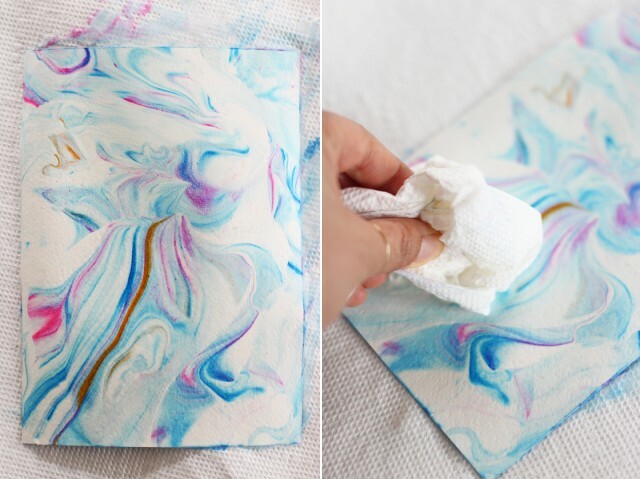 Take a fresh paper towel and wipe away any excess shaving cream. 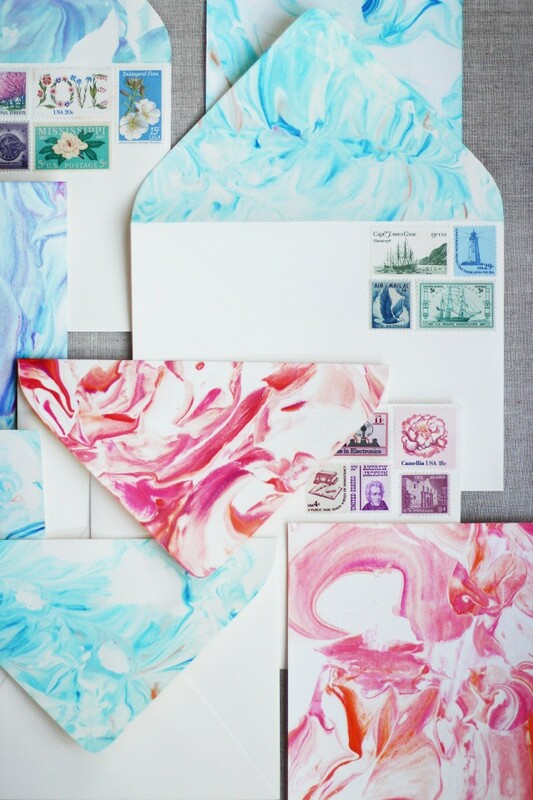 Set the paper aside to dry. Go back into the shaving cream and give it another couple folds. Put in another piece of paper, remove and scrape. You can keep repeating this process until the colors get too muddled. 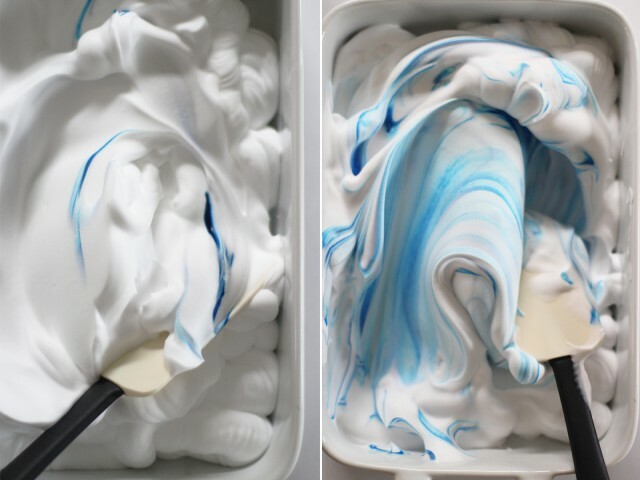 If there is too much dye, you can always add more shaving cream. Or if there is too much white space, you can always fold in more colors. Once all the notecards have dried, place them under a pile of heavy books to flatten out. The beauty is making mistakes. I have found the most beautiful patterns and colors happened by accident. Have fun with this!